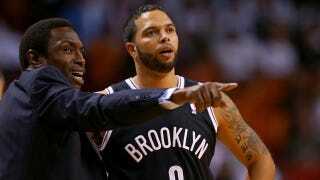 As reported by Yahoo's Adrian Wojnarowski, Avery Johnson is no longer the head coach of the Brooklyn Nets. The Nets, now with a 14-14 record, have been underwhelming during their first season in Brooklyn, and Johnson's firing comes on the heels of star point guard Deron Williams publicly complaining about the shortcomings of Johnson's offensive system. You may remember that Williams was widely blamed for Jerry Sloan's departure from the Utah Jazz. Williams better get used to carrying the "coach killer" label throughout the rest of his career. It's a tough exit for Johnson, who was named the coach of the month in November after leading his team to an 11-4 record to start the season, and was once considered one of the best coaches in the NBA. It's unlikely that we've seen the last of the Little General, though. If he doesn't find another head coaching job, he's likely to land a studio gig somewhere.